If you have signs and symptoms that worry you, make an appointment with your doctor. Your doctor will likely investigate more common causes of these signs and symptoms first. Doctors aren’t sure what causes stomach cancer. There is a strong correlation between a diet high in smoked and salted foods and stomach cancer. As the use of refrigeration for preserving foods has increased around the world, the rates of stomach cancer have declined. In general, cancer begins when an error (mutation) occurs in a cell’s DNA. The mutation causes the cell to grow and divide at a rapid rate and to continue living when a normal cell would die. The accumulating cancerous cells form a tumor that can invade nearby structures. And cancer cells can break off from the tumor to spread throughout the body. Cancer that begins in the glandular cells (adenocarcinoma): The glandular cells that line the inside of the stomach secrete a protective layer of mucus to shield the lining of the stomach from the acidic digestive juices. Adenocarcinoma accounts for the great majority of all stomach cancers. Cancer that begins in immune system cells (lymphoma): The walls of the stomach contain a small number of immune system cells that can develop cancer. Lymphoma in the stomach is rare. Cancer that begins in hormone-producing cells (carcinoid cancer): Hormone-producing cells can develop carcinoid cancer. Carcinoid cancer in the stomach is rare. Cancer that begins in nervous system tissues: A gastrointestinal stromal tumor (GIST) begins in specific nervous system cells found in your stomach. GIST is a rare form of stomach cancer. Because the other types of stomach cancer are rare, when people use the term “stomach cancer” they generally are referring to adenocarcinoma. A tiny camera to see inside your stomach (upper endoscopy): A thin tube containing a tiny camera is passed down your throat and into your stomach. Your doctor can look for signs of cancer. If any suspicious areas are found, a piece of tissue can be collected for analysis (biopsy). Imaging tests: Imaging tests used to look for stomach cancer include computerized tomography (CT) scans and a special type of X-ray exam sometimes called a barium swallow. Imaging tests: Tests may include a CT and positron emission tomography (PET). Exploratory surgery: Your doctor may recommend surgery to look for signs that your cancer has spread beyond your stomach within your abdomen. Exploratory surgery is usually done laparoscopically. This means the surgeon makes several small incisions in your abdomen and inserts a special camera that transmits images to a monitor in the operating room. Stage I: At this stage, the tumor is limited to the layer of tissue that lines the inside of the stomach. Cancer cells may also have spread to a limited number of nearby lymph nodes. Stage II: The cancer at this stage has spread deeper, growing into the muscle layer of the stomach wall. Cancer may also have spread to more of the lymph nodes. Stage III: At this stage, the cancer may have grown through all the layers of the stomach and spread to nearby structures. Or it may be a smaller cancer that has spread more extensively to the lymph nodes. Stage IV: This stage indicates that the cancer has spread to distant areas of the body. 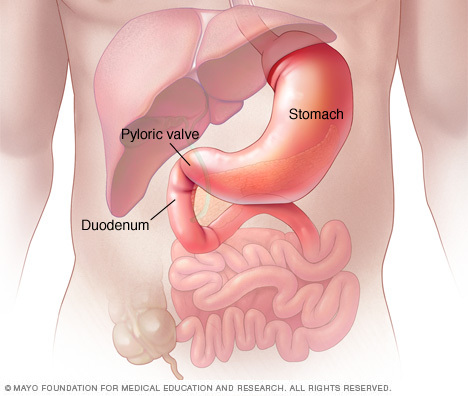 Removing early-stage tumors from the stomach lining: Very small cancers limited to the inside lining of the stomach may be removed using endoscopy in a procedure called endoscopic mucosal resection. The endoscope is a lighted tube with a camera that’s passed down your throat into your stomach. The doctor uses special tools to remove the cancer and a margin of healthy tissue from the stomach lining. Removing a portion of the stomach (subtotal gastrectomy): During subtotal gastrectomy, the surgeon removes only the portion of the stomach affected by cancer. Removing the entire stomach (total gastrectomy): Total gastrectomy involves removing the entire stomach and some surrounding tissue. The esophagus is then connected directly to the small intestine to allow food to move through your digestive system. Removing lymph nodes to look for cancer: The surgeon examines and removes lymph nodes in your abdomen to look for cancer cells. Surgery to relieve signs and symptoms: Removing part of the stomach may relieve signs and symptoms of a growing tumor in people with advanced stomach cancer. In this case, surgery can’t cure advanced stomach cancer, but it can make you more comfortable. Radiation therapy can be used before surgery (neoadjuvant radiation) to shrink a stomach tumor so that it’s more easily removed. Radiation therapy can also be used after surgery (adjuvant radiation) to kill any cancer cells that might remain around your stomach. Radiation is often combined with chemotherapy. In cases of advanced cancer, radiation therapy may be used to relieve side effects caused by a large tumor. Chemotherapy can be given before surgery (neoadjuvant chemotherapy) to help shrink a tumor so that it can be more easily removed. Chemotherapy is also used after surgery (adjuvant chemotherapy) to kill any cancer cells that might remain in the body. Chemotherapy is often combined with radiation therapy. Chemotherapy may be used alone in people with advanced stomach cancer to help relieve signs and symptoms. Chemotherapy side effects depend on which drugs are used. The type of stomach cancer you have determines which chemotherapy drugs you’ll receive. Trastuzumab (Herceptin): for stomach cancer cells that produce too much HER2. 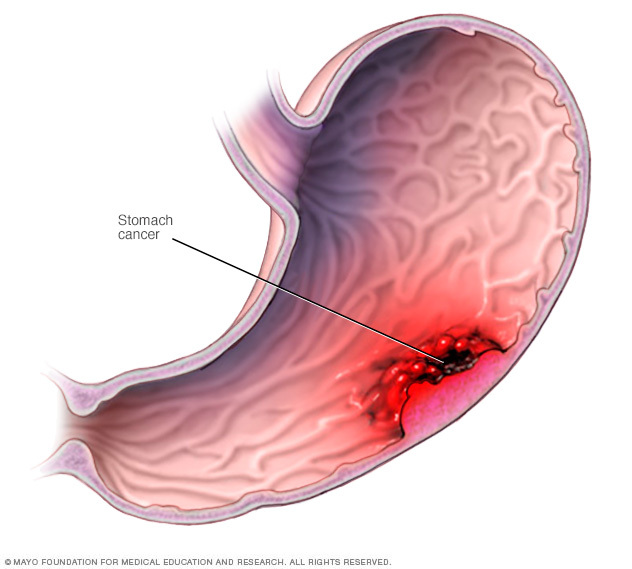 Ramucirumab (Cyramza): for advanced stomach cancer that hasn’t responded to other treatments. Imatinib (Gleevec): for a rare form of stomach cancer called gastrointestinal stromal tumor. Sunitinib (Sutent): for gastrointestinal stromal tumors. Regorafenib (Stivarga): for gastrointestinal stromal tumors. Tests of your cancer cells can tell your doctor whether these treatments are likely to work for you. Clinical trials are studies of new treatments and new ways of using existing treatments. Participating in a clinical trial may give you a chance to try the latest treatments. But clinical trials can’t guarantee a cure. In some cases, researchers might not be certain of a new treatment’s side effects. Ask your doctor whether you may be eligible for a clinical trial. Together you can discuss the benefits and risks. Palliative care is specialized medical care that focuses on providing relief from pain and other symptoms of a serious illness. Palliative care specialists work with you, your family and your other doctors to provide an extra layer of support that complements your ongoing care. Palliative care can be used while undergoing other aggressive treatments, such as surgery, chemotherapy or radiation therapy. Palliative care is provided by a team of doctors, nurses and other specially trained professionals. Palliative care teams aim to improve the quality of life for people with cancer and their families. This form of care is offered alongside curative or other treatments you may be receiving.